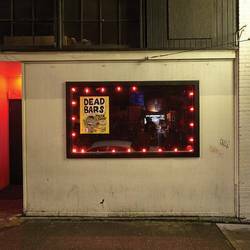 Reading that Dead Bars never meant to be a band explains a lot of things. They started as a one-off project to go on a tour rather than to share their art. It turned out to be fun and they stuck with it. After a series of 7”s, the Seattle now-band finally releases their first full-length in 2017, titled Dream Gig. The reason for the introductory bio is that Dead Bars’ approach feels spontaneous. The lyrics aren’t bad by any means, but they meander feel like an undercurrent to the real power of the band, which is the chord-driven punk rawk. It’s more about energy and emotion than poetry. In a way, it reminds me of the similarly-formed Too Many Daves but with less of a gimmick. Besides sharing many stages together at The Fest and being peers on No Idea Records, Dead Bars are pretty different though. The defining character of the band is their personal approach that blends with fists-up punk. While it’s aggressive in tone, the tempo is really middling. John Maiello rambles in the first person about seemingly banal daily experiences at shows, in bars, and elsewhere as the songs build. Usually the song picks up after the first bridge and the lyrics morph from the mundane into bigger picture metaphors where singing about how a girl shares her earplugs or catching the D-Line home has much larger meaning. That chaotic culmination reminds me a bit of ‘80s West Coast punk. Meanwhile, the lyrical tone is about being an aging punk, directly addressed in the title track. It’s a defeatist call to enjoy a miserable life. Dream Gig shows that there is always escape as reason to be celebrating instead of sulking. Posted March 13, 2017, 7:32 p.m.
Posted Sept. 10, 2015, 12:19 a.m.
Posted March 24, 2019, 4:59 p.m.
Posted Sept. 22, 2018, 10:31 a.m.